Smedley Butler -from Wikipedia, all citations included. Smedley Darlington Butler (July 30, 1881 – June 21, 1940) was a United States Marine Corpsmajor general, the highest rank authorized at that time, and at the time of his death the most decorated Marine in U.S. history. During his 34-year career as a Marine, he participated in military actions in the Philippines, China, in Central America and the Caribbean during the Banana Wars, and France in World War I. Butler is well known for having later become an outspoken critic of U.S. wars and their consequences, as well as exposing the Business Plot, a purported plan to overthrow the U.S. government. By the end of his career, Butler had received 16 medals, five for heroism. He is one of 19 men to twice receive the Medal of Honor, one of three to be awarded both the Marine Corps Brevet Medal and the Medal of Honor, and the only Marine to be awarded the Brevet Medal and two Medals of Honor, all for separate actions. In 1933, he became involved in a controversy known as the Business Plot, when he told a congressional committee that a group of wealthy industrialists were planning a military coup to overthrow Franklin D. Roosevelt, with Butler selected to lead a march of veterans to become dictator, similar to other Fascist regimes at that time. The individuals involved all denied the existence of a plot and the media ridiculed the allegations. A final report by a special House of Representatives Committee confirmed some of Butler’s testimony. In 1935, Butler wrote a book titled War Is a Racket, where he described and criticized the workings of the United States in its foreign actions and wars, such as those he was a part of, including the American corporations and other imperialist motivations behind them. After retiring from service, he became a popular activist, speaking at meetings organized by veterans, pacifists and church groups in the 1930s. Smedley Butler was born July 30, 1881, in West Chester, Pennsylvania, the eldest of three sons. His parents, Thomas and Maud (née Darlington) Butler, were descended from local Quaker families. His father was a lawyer, a judge and, for 31 years, a Congressman and chair of the House Naval Affairs Committee during the Harding and Coolidge administrations. His maternal grandfather was Smedley Darlington, a Republican Congressman from 1887 to 1891. Butler attended the West Chester Friends Graded High School, followed by The Haverford School, a secondary school popular with sons of upper-class Philadelphia families. A Haverford athlete, he became captain of its baseball team and quarterback of its football team. Against the wishes of his father, he left school 38 days before his seventeenth birthday to enlist in the Marine Corps during the Spanish–American War. Nevertheless, Haverford awarded him his high school diploma on June 6, 1898, before the end of his final year; his transcript stated he completed the Scientific Course “with Credit”. In the anti-Spanish war fever of 1898, Butler lied about his age to receive a direct commission as a Marine second lieutenant. He trained in Washington D.C. at the Marine Barracks on the corner of 8th and I Streets. In July 1898, he went to Guantánamo Bay, Cuba, arriving shortly after its invasion and capture. His company soon returned to the U.S. and after a short break, he was assigned to the armored cruiser USS New York for four months. He came home to be mustered out of service in February 1899, but in April 1899, he accepted a commission as a first lieutenant in the Marine Corps. The Marine Corps sent him to the Manila, Philippines. On garrison duty with little to do, he turned to alcohol to relieve the boredom. He once became drunk and was temporarily relieved of command after an unspecified incident in his room. In October 1899, he saw his first combat action when he led 300 Marines to take the town of Noveleta, from Filipino rebels known as Insurrectos. In the initial moments of the assault, his first sergeant was wounded. Butler briefly panicked, but quickly regained his composure and led his Marines in pursuit of the fleeing enemy. By noon the Marines had dispersed the rebels and taken the town. One Marine had been killed and ten were wounded. Another 50 Marines had been incapacitated by the humid tropical heat. After the excitement of this combat, garrison duty again became routine. Butler had a very large Eagle, Globe, and Anchor tattoo made which started at his throat and extended to his waist. He also met Littleton Waller, a fellow Marine with whom he maintained a lifelong friendship. When Waller received command of a company in Guam, he was allowed to select five officers to take with him; he chose Butler. Before they had departed, their orders were changed and they were sent to China aboard the USS Solace to help put down the Boxer Rebellion. Butler being carried on the back of another Marine to safety across a river at the Battle of Tientsin. The Secretary of the Navy takes pleasure in transmitting to First Lieutenant Smedley Darlington Butler, United States Marine Corps, the Brevet Medal which is awarded in accordance with Marine Corps Order No. 26 (1921), for distinguished conduct and public service in the presence of the enemy while serving with the Second Battalion of Marines, near Tientsin, China, on 13 July 1900. On 28 March 1901, First Lieutenant Butler is appointed Captain by brevet, to take rank from 13 July 1900. Butler participated in a series of occupations, police actions, and interventions by the United States in Central America and the Caribbean, commonly called the Banana Wars because their goal was to protect American commercial interests in the region, particularly those of the United Fruit Company. This company had significant financial stakes in the production of bananas, tobacco, sugar cane, and other products throughout the Caribbean, Central America and the northern portions of South America. The U.S. was also trying to advance its own political interests by maintaining its influence in the region and especially its control of the Panama Canal. These interventions started with the Spanish–American War in 1898 and ended with the withdrawal of troops from Haiti and President Franklin D. Roosevelt’s Good Neighbor Policy in 1934. After his retirement, Butler became an outspoken critic of the business interests in the Caribbean, criticizing the ways in which U.S. businesses and Wall Street bankers imposed their agenda on United States foreign policy during this period. In 1903 Butler was stationed in Puerto Rico on Culebra Island. Hearing rumors of a Honduran revolt, the United States government ordered his unit and a supporting naval detachment to sail to Honduras, 1,500 miles (2,414 km) to the west, to defend the U.S. Consulate in Honduras. Using a converted banana boat renamed the Panther, Butler and several hundred Marines landed at the port town of Puerto Cortés. In a letter home, he described the action: they were “prepared to land and shoot everybody and everything that was breaking the peace”, but instead found a quiet town. The Marines re-boarded the Panther and continued up the coast line looking for rebels at several towns, but found none. When they arrived at Trujillo, however, they heard gunfire, and came upon a battle in progress that had been waged for 55 hours between rebels called Bonillista and Honduran government soldiers at a local fort. At the sight of the Marines, the fighting ceased and Butler led a detachment of Marines to the American consulate, where he found the consul, wrapped in an American flag, hiding among the floor beams. As soon as the Marines left the area with the shaken consul, the battle resumed and the Bonillistas soon controlled the government. During this expedition Butler earned the first of his nicknames, “Old Gimlet Eye”. It was attributed to his feverish, bloodshot eyes—he was suffering from some unnamed tropic fever at the time—which enhanced his penetrating and bellicose stare. After the Honduran campaign, Butler returned to Philadelphia. He married Ethel Conway Peters of Philadelphia in Bay Head, New Jersey on June 30, 1905. His best man at the wedding was his former commanding officer in China, Lieutenant Colonel Littleton W. T. Waller. The couple eventually had three children: a daughter, Ethel Peters Butler (Mrs. John Wehle), and two sons, Smedley Darlington, Jr. and Thomas Richard. Butler was next assigned to garrison duty in the Philippines, where he once launched a resupply mission across the stormy waters of Subic Bay after his isolated outpost ran out of rations. In 1908, he was diagnosed as having a nervous breakdown and received nine months sick leave which he spent at home. He successfully managed a coal mine in West Virginia, but returned to active duty in the Marine Corps at the first opportunity. From 1909 to 1912, Butler served in Nicaragua, enforcing U.S. policy, and once again led his battalion to the relief of a rebel-besieged city, this time Granada, and again, with a 104-degree fever. In December 1909, he commanded the 3d Battalion, 1st Marine Regiment, 1st Marine Regiment, on the Isthmus of Panama. On August 11, 1912, he was temporarily detached to command an expeditionary battalion with which he participated in the bombardment, assault and capture of Coyotepe Hill, Nicaragua in October 1912. He remained in Nicaragua until November 1912, when he rejoined the Marines of 3d Battalion, 1st Marine Regiment, at Camp Elliott, Panama. For distinguished conduct in battle, engagement of Vera Cruz, 22 April 1914. Major Butler was eminent and conspicuous in command of his battalion. He exhibited courage and skill in leading his men through the action of the 22d and in the final occupation of the city. After the occupation of Veracruz, many military personnel received the Medal of Honor, an unusually high number that diminished somewhat the prestige of the award. The Army presented one, nine went to Marines and 46 were bestowed upon Navy personnel. During World War I, Butler, then a major, attempted to return his Medal, explaining he had done nothing to deserve it. The medal was returned with orders to keep it and to wear it as well. For extraordinary heroism in action as Commanding Officer of detachments from the 5th, 13th, 23d Companies and the Marine and sailor detachment from the U.S.S. Connecticut, Major Butler led the attack on Fort Riviere, Haiti, 17 November 1915. Following a concentrated drive, several different detachments of Marines gradually closed in on the old French bastion fort in an effort to cut off all avenues of retreat for the Caco bandits. Reaching the fort on the southern side where there was a small opening in the wall, Major Butler gave the signal to attack and Marines from the 15th Company poured through the breach, engaged the Cacos in hand-to-hand combat, took the bastion and crushed the Caco resistance. Throughout this perilous action, Major Butler was conspicuous for his bravery and forceful leadership. The President of the United States of America, authorized by Act of Congress, July 9, 1918, takes pleasure in presenting the Army Distinguished Service Medal to Brigadier General Smedley Darlington Butler, United States Marine Corps, for exceptionally meritorious and distinguished services to the Government of the United States, in a duty of great responsibility during World War I. Brigadier General Butler commanded with ability and energy Pontanezen Camp at Brest during the time in which it has developed into the largest embarkation camp in the world. Confronted with problems of extraordinary magnitude in supervising the reception, entertainment and departure of the large numbers of officers and soldiers passing through this camp, he has solved all with conspicuous success, performing services of the highest character for the American Expeditionary Forces. The President of the United States of America takes pleasure in presenting the Navy Distinguished Service Medal to Brigadier General Smedley Darlington Butler, United States Marine Corps, for exceptionally meritorious and distinguished services in France, during World War I. Brigadier General Butler organized, trained and commanded the 13th Regiment Marines; also the 5th Brigade of Marines. He commanded with ability and energy Camp Pontanezen at Brest during the time in which it has developed into the largest embarkation camp in the world. Confronted with problems of extraordinary magnitude in supervising the reception, entertainment and departure of large numbers of officers and soldiers passing through the camp, he has solved all with conspicuous success, performing services of the highest character for the American Expeditionary Forces. Following the war, he became Commanding General of the Marine Barracks at Marine Corps Base Quantico, Virginia. At Quantico, he transformed the wartime training camp into a permanent Marine post. During a training exercise in western Virginia in 1921, he was told by a local farmer that Stonewall Jackson‘s arm was buried nearby, to which he replied, “Bosh! I will take a squad of Marines and dig up that spot to prove you wrong!” Butler found the arm in a box. He later replaced the wooden box with a metal one, and reburied the arm. He left a plaque on the granite monument marking the burial place of Jackson’s arm; the plaque is no longer on the marker but can be viewed at the Chancellorsville Battlefield visitor’s center. From 1927 to 1929, Butler was commander of the Marine Expeditionary Force in China and, while there, cleverly parlayed his influence among various generals and warlords to the protection of U.S. interests, ultimately winning the public acclaim of contending Chinese leaders. 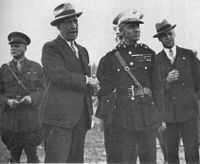 When Butler returned to the United States in 1929 he was promoted to major general, becoming, at age 48, the youngest major general of the Marine Corps. He directed the Quantico camp’s growth until it became the “showplace” of the Corps. Butler won national attention by taking thousands of his men on long field marches, many of which he led from the front, to Gettysburg and other Civil War battle sites, where they conducted large-scale re-enactments before crowds of distinguished spectators. In 1931, Butler violated diplomatic norms by publicly recounting gossip about Benito Mussolini in which the dictator allegedly struck and killed a child with his speeding automobile in a hit-and-run accident. The Italian government protested and President Hoover, who strongly disliked Butler, forced Secretary of the Navy Charles Francis Adams III to court-martial him. Butler became the first general officer to be placed under arrest since the Civil War. He apologized to Secretary Adams and the court-martial was canceled with only a reprimand. In the old Marine tradition, when a Commandant retired or died, it was customary for the senior Marine Corps general to assume the position of Commandant while a new one was chosen. However, when Marine Corps commandant Major General Wendell C. Neville died July 8, 1930, Butler, at that time the senior major general in the Corps, was not appointed. 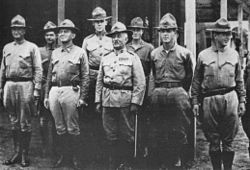 Although he had significant support from many inside and outside the Corps, including John Lejeune and Josephus Daniels, two other Marine Corps generals were seriously considered for the post, Ben H. Fuller and John H. Russell. 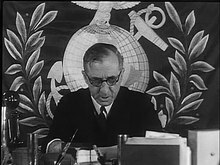 General Lejeune and others petitioned President Hoover, garnered support in the Senate and flooded Secretary of the Navy Charles Adams’s desk with more than 2,500 letters of support. With the recent death of his influential father, however, Butler had lost much of his protection from his civilian superiors. The outspokenness that characterized his run-ins with the Mayor of Philadelphia, the “unreliability” mentioned by his superiors when opposing a posting to the Western Front, and his comments about Benito Mussolini resurfaced. In the end, the position of Commandant went to Major General Ben H. Fuller and, at his own request, Butler retired from active duty on October 1, 1931. Even before retiring from the Corps, Butler began developing his post-Corps career. In May 1931, he took part in a commission established by Oregon Governor Julius L. Meier. The commission laid the foundations for the Oregon State Police. He began lecturing at events and conferences and after his retirement from the Marines in 1931, he took this up full-time. He donated much of his earnings from his lucrative lecture circuits to the Philadelphia unemployment relief. He toured the western United States, making 60 speeches before returning for his daughter’s marriage to Marine aviator Lieutenant John Wehle. Her wedding was the only time that he wore his dress blue uniform after he left the Marines. He announced his candidacy for the U.S. Senate in the Republican primary in Pennsylvania in March 1932 as a proponent of Prohibition, known as a “dry”. He allied with Gifford Pinchot, but they were defeated by Senator James J. Davis. According to biographer Mark Strecker, Butler then moved politically to the far left, voting for Norman Thomas of the Socialist Party for president in 1936. During his Senate campaign, Butler spoke out forcefully about the veterans bonus. Veterans of World War I, many of whom had been out of work since the beginning of the Great Depression, sought immediate cash payment of Service Certificates granted to them eight years earlier via the World War Adjusted Compensation Act of 1924. Each Service Certificate, issued to a qualified veteran soldier, bore a face value equal to the soldier’s promised payment, plus compound interest. The problem was that the certificates (like bonds), matured 20 years from the date of original issuance, thus, under extant law, the Service Certificates could not be redeemed until 1945. In June 1932, approximately 43,000 marchers—17,000 of whom were World War I veterans, their families, and affiliated groups—protested in Washington, D.C. The Bonus Expeditionary Force, also known as the “Bonus Army“, marched on Washington to advocate the passage of the “soldier’s bonus” for service during World War I. After Congress adjourned, bonus marchers remained in the city and became unruly. On July 28, 1932, two bonus marchers were shot by police, causing the entire mob to become hostile and riotous. The FBI, then known as the United States Bureau of Investigation, checked its fingerprint records to obtain the police records of individuals who had been arrested during the riots or who had participated in the bonus march. The veterans made camp in the Anacostia flats while they awaited the congressional decision on whether or not to pay the bonus. The motion, known as the Patman bill, was decisively defeated, but the veterans stayed in their camp. Butler arrived with his young son Thomas, in mid-July the day before the official eviction by the Hoover administration. He walked through the camp and spoke to the veterans; he told them that they were fine soldiers and they had a right to lobby Congress just as much as any corporation. He and his son spent the night and ate with the men, and in the morning Butler gave a speech to the camping veterans. He instructed them to keep their sense of humor and cautioned them not to do anything that would cost public sympathy. On July 28, army cavalry units led by General Douglas MacArthur dispersed the Bonus Army by riding through it and using gas. During the conflict several veterans were killed or injured and Butler declared himself a “Hoover-for-Ex-President-Republican”. Upon his retirement, Butler bought a home in Newtown Square, Pennsylvania, where he lived with his wife. In June 1940, he checked himself into the hospital after becoming sick a few weeks earlier. His doctor described his illness as an incurable condition of the upper gastro-intestinal tract that was probably cancer. His family remained by his side, even bringing his new car so he could see it from the window. He never had a chance to drive it. On June 21, 1940, Smedley Butler died in the Naval Hospital in Philadelphia. The funeral was held at his home, attended by friends and family as well as several politicians, members of the Philadelphia police force and officers of the Marine Corps. He was buried at Oaklands Cemetery near West Chester, Pennsylvania. Since his death in 1940, his family has maintained his home as it was when he died, including a large amount of memorabilia he had collected throughout his varied career. The USS Butler (DD-636), a Gleaves-classdestroyer, was named in his honor in 1942. This vessel participated in the European and Pacific theaters of operations during the Second World War. She was later converted to a high speed minesweeper. The Boston, Massachusetts, chapter of Veterans for Peace is called the Smedley D. Butler Brigade in his honor. Butler was featured in the documentary filmThe Corporation. In his book My First Days in the White House, Senator Huey Long of Louisiana stated that, if elected to the presidency, he would name Butler as his Secretary of War. His childhood home at West Chester, The Butler House, was listed on the National Register of Historic Places in 1980. Butler, Smedley; Burks, Arthur J. (1927). Walter Garvin in Mexico. Dorrance, Philadelphia. OCLC 3595275. ——; de Ronde, Philip (1935). Paraguay : A Gallant Little Nation : The Story of Paraguay’s War with Bolivia. OCLC 480786605. —— (1934). Speech. Smedley Butler Talks on Black Shirts in America, Philadelphia. Hearst Vault Material, HVMc71r2, 1447. ——; Venzon, Anne Cipriano. The Papers of General Smedley Darlington Butler, USMC, 1915–1918. OCLC 10958085. ——; Murphy, William R. Letter to William R. Murphy, 1925 April 25. OCLC 53437731. —— (July 1929). “The Annals of the American Academy of Political and Social Science”. American Marines in China. OCLC 479642987. —— (1933). Old Gimlet Eye. New York : Farrar & Rinehart. ISBN 0-940328-01-1. OCLC 219896546. ——; Lejeune, John Archer; Miller, J. Michael (2002). 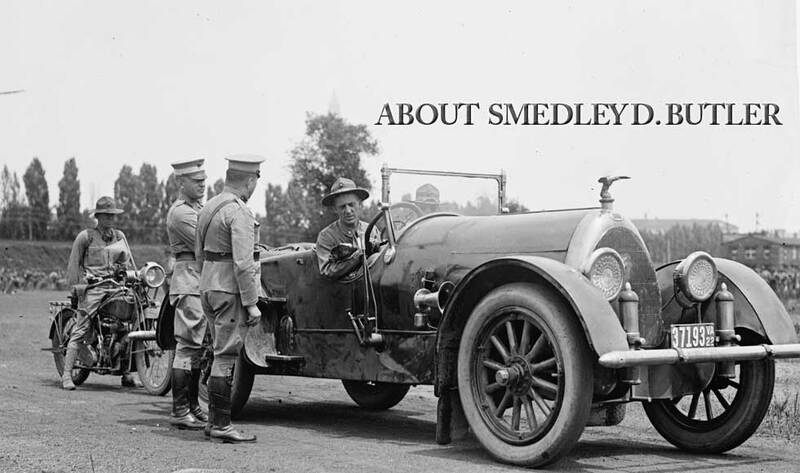 My Dear Smedley: Personal Correspondence of John A. LeJeune and Smedley D. Butler, 1927–1928. Marine Corps Research Center. —— (1935; reprint, 2003). War Is a Racket. Los Angeles: Feral House. ISBN 0-922915-86-5. ^ The Expeditionary Medal, as was worn for part of his career, would have used award numerals; in Butler’s case, a “4” would have been worn to denote 4 deployments. The wearing of numerals was discontinued in 1921 in favor of service stars. ^ a b c d e f g h i j k l m Who’s Who in Marine Corps History. History Division, United States Marine Corps https://www.mcu.usmc.mil/historydivision/Pages/Who%27s%20Who/A-C/Butler_SD.aspx |url= missing title (help). Retrieved August 13, 2013. ^ “Report of the Commandant of the United States Marine Corps, Marines in China: The Relief Expedition”. United States Marine Corps. September 29, 1900. Retrieved August 17, 2006. ^ a b c d e f g h i j k “Smedley Butler”. Hall of Valor. Military Times. Retrieved March 4, 2010. ^ “Butler−Peters”. New York Times. 1 July 1905. Retrieved 9 October 2012. ^ “Mrs. Smedlet Butler”. New York Times. 16 June 1962. Retrieved 9 October 2012. ^ Editors of the Boston Publishing Company (1985). Above and Beyond, A History of the Medal of Honor from the Civil War to Vietnam. p. 113. ISBN 0-8094-5628-1. ^ a b “Leatherneck legends; Swapping some sea stories at the birthday ball? Here are 8 of the Corps’ best”. Marine Corps Times: 22. November 15, 2004. ^ “Oregon State Police History”. Oregon State Police, Official Oregon State website. Retrieved October 14, 2007. ^ Mark Strecker (2011). Smedley D. Butler, USMC: A Biography. McFarland. p. 156. ^ a b “Bonus March”. Federal Bureau of Investigation. Archived from the original on February 8, 2010. Retrieved March 9, 2010. ^ a b “Gen. Butler Bares a ‘Fascist Plot‘“. The New York Times: 1. November 21, 1934. ^ “Credulity Unlimited”. The New York Times. November 22, 1934. ^ “Plot Without Plotters”. Time magazine. December 3, 1934. ^ Smedley Butler House, Newtown Square Historical Preservation Society. Accessed September 15, 2011. ^ “Major General Smedley D. Butler, USMC”. Oaklands Cemetery. 2008. Retrieved 2010-03-13. ^ “Butler”. Dictionary of American Naval Fighting Ships. Naval History & Heritage Command, Department of the Navy. Retrieved October 14, 2007. ^ “Smedley D. Butler Brigade Chapter 9 Veterans for Peace”. Veterans For Peace. Retrieved October 13, 2007. ^ “Synopsis”. Big Picture Media Corporation. Retrieved October 13, 2007. ^ “National Register Information System”. National Register of Historic Places. National Park Service. 2010-07-09. Archer, Jules (1973). The Plot to Seize the White House. Hawthorne Books. ISBN 1-60239-036-3. Boot, Max (2003). The Savage Wars of Peace (First Paperback ed.). Basic Books. ISBN 0-465-00721-X. LCCN 2004695066. Burk, Robert F. (1990). The Corporate State and the Broker State: The Du Ponts and American National Politics, 1925–1940. Harvard University Press. ISBN 0-674-17272-8. “Butler – Peters”. The New York Times (PDF|format= requires |url= (help)) (The New York Times Company). July 1, 1905. p. 9. “Butler”. Dictionary of American Naval Fighting Ships. Naval History & Heritage Command, Department of the Navy. Retrieved October 14, 2007. Butler, Smedley Darlington and Venzon, Anne Cipriano (1992). General Smedley Darlington Butler: The Letters of a Leatherneck, 1898–1931. Praeger. ISBN 0-275-94141-8. Retrieved October 14, 2007. “Credulity Unlimited”. The New York Times (The New York Times Company). November 22, 1934. Editors of the Boston Publishing Company (1985). Above and Beyond, A History of the Medal of Honor from the Civil War to Vietnam. p. 113. ISBN 0-8094-5628-1. “Gen. Butler Bares a ‘Fascist Plot‘“. New York Times (The New York Times Company). November 21, 1934. p. 1. “Hall of Valor”. Smedley Butler. Military Times. Retrieved August 4, 2009. Klehr, Harvey (1984). The Heyday of American Communism. Basic Books. pp. 110–12, 372–73. ISBN 0-465-02946-9. Langley, Lester D. (1985). The Banana Wars: United States Intervention in the Caribbean, 1898–1934. Lexington: University Press of Kentucky. ISBN 0-8420-5047-7. “Leatherneck legends; Swapping some sea stories at the birthday ball? Here are 8 of the Corps’ best”. Marine Corps Times (Army Times Publishing Company): 22. November 15, 2004. Lelle, John E. SgtMaj. USMC (Ret) (1988). The Brevet Medal. Quest Publishing Co. ISBN 0-915779-02-1. “Major General Smedley D. Butler”. Marine Corps Legacy Museum. Retrieved October 13, 2007. “Major General Smedley D. Butler, USMC”. Who’s Who in Marine Corps History. History Division, United States Marine Corps. Retrieved October 13, 2007. 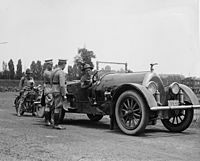 “Oregon State Police History”. Oregon State Police, Official Oregon State website. Retrieved October 14, 2007. “Plot Without Plotters”. Time magazine (Time Warner). December 3, 1934. Retrieved March 13, 2010. “Report of the Commandant of the United States Marine Corps, Marines in China: The Relief Expedition”. United States Marine Corps. September 29, 1900. Retrieved August 17, 2006. Sargent, James E.; Archer, Jules (November 1974). “Review of: The Plot to Seize the White House, by Jules Archer”. The History Teacher (Society for History Education) 8 (1): 151–2. doi:10.2307/491493. JSTOR 491493. Schmidt, Hans (1998). Maverick Marine: General Smedley D. Butler and the Contradictions of American Military History (reprint ed.). University Press of Kentucky. ISBN 0-8131-0957-4. Schmidt, Hans (1995). The United States occupation of Haiti, 1915–1934 (reprint, illustrated ed.). Rutgers University Press. ISBN 978-0-8135-2203-6. “Smedley D. Butler Brigade Chapter 9 Veterans for Peace”. Retrieved October 13, 2007. “Synopsis”. Big Picture Media Corporation. Retrieved October 13, 2007. Ward, Geoffrey C. “Ollie and Old Gimlet Eye”. American Heritage Magazine. Archived from the original on September 13, 2007. Retrieved October 14, 2007. War Is A Racket Speech and book by the same name that he wrote. Wikimedia Commons has media related to Smedley D. Butler. “Camp Smedley Butler website”. United States Marine Corps. Retrieved January 28, 2010. McFall, J. Arthur (February 2003). “After 33 years of Marine service, Smedley Butler became an outspoken critic of U.S. foreign policy”. Military History 19 (6): 16. Sweetman, Jack (1968). The Landing at Veracruz: 1914. Naval Institute Press, Annapolis, MD.